When you look at an online poker site, what are you looking for? Are you seeking great games and bonuses, but also want to enjoy beautiful graphics? Are you in search of the newest gimmicks and advances, or are you someone that is less flashy, but totally high class? There are many different online poker rooms out there these days, and they all offer something different, but if you’re looking for an online poker room that offers high class, high stakes games, then you might be looking for a site like Lock Poker. Many of the more classic, high class poker players out there might think that online gaming isn’t for them because it just all seems so tacky. If this sounds like you, then you haven’t seen this amazing online poker room yet – but you really should take a look. 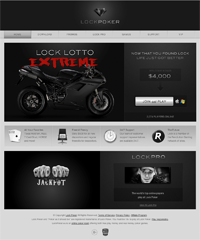 Are you wondering what you’ll find when you choose to play your online poker with Lock Poker? We know that it can be tough to choose a great online poker room, and you’re not alone, so let’s start from the beginning. Software that’s easy to use and download. Forget about complicated software downloads that you might not even understand and check out the easy to download and use software at this site. You don’t want to waste your time and energy screwing around with downloads or usage problems, so why not make sure that you get easy software before you start on a site? If you want to play poker and not worry about the software that you use, then this is the site for you. Amazing bonuses. How does up to $4000 sign on bonus sound to you? It’s more than you’ll find anywhere else and if you’re a serious poker player, then you know that a big deposit makes for great chances to win the really high stakes games. Lock Poker knows that big players make big deposits and they deserve some big rewards, so they are making sure that you can enjoy more bonuses when you want them. What makes these bonuses even better is that they are easy to cash in, enjoy and understand, so no stumbling around trying to make sure you can enjoy your free cash before it expires. Easy to become a VIP. Everyone wants to become a VIP, but with many online poker rooms, it can seem nearly impossible to enjoy these benefits. With Lock Poker, it’s easy to enjoy VIP status, which comes with great extras like 15% cash back at white VIP status and the rewards go up from there, so no matter if you play only a little, or a lot, you’re going to be able to enjoy being appreciated even more. The beautiful part of becoming a VIP is that you don’t have to pay for a VIP membership. You can enjoy this status just by playing, and depositing like you normally would – no extra membership payments required. The games you really love. No matter how much you love to play online poker, it can get a little dull playing the same game over and over again. When you play poker online with Lock Poker, you’re going to find that there is a wide selection of poker games for you to enjoy, so whether you’re a huge fan of Texas Hold ‘Em, or you want something a little different like Ace 5 Low Ball, you’re going to find whatever you want when you want. Even better, if you’re a little sketchy on the rules of the games, Lock has made sure to provide you with the rules so you don’t have to go into any game feeling blind. Tournaments you really want to play in. If you’re a tournament poker player, you know how frustrating it can be to go to an online poker room that offers tournaments, but they are few and far between. Then when you get to them, you find that the jackpot isn’t nearly what you had hoped it would be. When you play with Lock Poker, you’re going to enjoy tournaments with great jackpots and high stakes, so you’ll never be short on excitement or fun. This is where you can go to really enjoy the high stakes games that you’re craving, and these games can’t be more thrilling or heated. Of course there are many more features to Lock Poker that you’re sure to enjoy, like the top notch customer service that this online poker room has to offer. Any time that you’re in need of a real person to talk to about anything with your account, from the software, to questions about your winnings; you’re going to find that you only have to make a quick and easy phone call to find a resolution. If you’re looking for even more fun, you might like the Battle of the Knights. This is a top notch thrilling promotion where there are 17,000 cash prizes with a total jackpot of $2,000,000. This promotion is one of the many amazing promos that Lock Poker provides; this is just what September brings. You’re going to find that at this online poker room, there is never a shortage of huge, easy to take part in promotions. It’s a great way to increase your bank roll, win totally free cash and have a great time while you’re at it. If you’re looking for a high class online poker room, but still want to enjoy all the bonuses, tournaments and promotions that a great online poker room has to offer, then Lock Poker might just be the right site for you. Why not take a look at it, enjoy an easy download, and start playing online poker the way that you really want to play for a change? You can play online poker just about anywhere, but if you don’t play at the right site, you won’t enjoy all the benefits of playing with Lock Poker.